Day 20 of Art Every Day Month. When I was a little girl, I had a set of dog magnets. One was a black Scottish Terrier and one was white. I hadn’t heard of Westies then, but I think the white was supposed to be a West Highland terrier. I loved playing with the magnets, and have had a soft spot for Scottish Terriers and Westies ever since. I’ve never owned either, but if I was to buy or adopt a terrier it would be a Westie. My Mom has the pleasure of owning a Westie-Poo named Mac, and he’s a cute little thing. This painting is dedicated to her and Mac. I worked digitally in Paint Shop Pro and Photoshop. My reference was a stock photo found on sxc.hu, here. If you’d like to view it in a larger version, please visit my gallery. Hmmm…I think I’ve given away part of my Mom’s Christmas present. 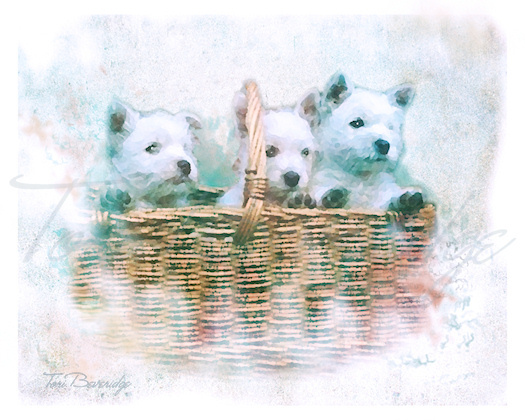 Posted in Uncategorized and tagged art, artist, artwork, digital art, dog, dog art, painting, West Highland Terrier, Westie. My goodness I can't believe this was painted digitally. Another incredible piece.